Hector Ortiz took a moment in August 2000 to reflect to The Topeka Capital-Journal on what got him to that point - and what he needed to go going forward. That point was a return to the majors, two years after his brief, four-game major league debut, and 12 years after his professional debut. "It's taken me so long to get here, I have to do the most I can with every opportunity they give me to demonstrate that I can play on this level," Ortiz told The Capital-Journal. "This is the best baseball in the world in the big leagues, and if you do good here you feel like you're on top of the world." Ortiz remained on top with the Royals for 26 games that year and 56 the next. In all, Ortiz saw time in four big league seasons, part of a career that spanned nearly two decades. He's since returned to the bigs in his new role, as coach. Ortiz' career in baseball began in 1988, taken by the Dodgers in the 35th round of the draft out of Ranger College. He started with short-season Salem. He returned there and hit single-A Vero Beach in 1989, then played 1990 at short-season Yakima. The catcher hit .272 over 52 games there, including a 2 for 4 effort to end the season. Ortiz made AA San Antonio in 1992 and AAA Albuquerque in 1993, but he never made Los Angeles. 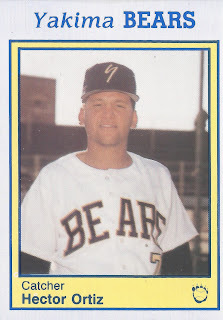 He moved to the Cubs system and AA Orlando in 1995, then to the Royals and AA and AAA in 1997. In September 1998, he made his major league debut with Kansas City. He got into four games, saw four at bats and didn't get a hit. After a season back in the minors, he returned to Kansas City. He hit .386 in 26 games. His work on his hitting propelled him back to the bigs, as he worked in winter ball, according to The St. Petersburg Times. "He's got an above-average arm. He blocks balls well. I like the way he sets up," Royals catcher coach Jamie Quirk told The Times. "Now that he's getting a chance, he'll be considered a major-league catcher rather than a minor-leaguer. And he's improved his hitting 1,000 percent the last couple of years." Ortiz played in another 56 games for Kansas City in 2001. He hit .247 and knocked in 11. He then played 2002 with the Rangers. In seven games there, he hit .214, but also hit his only major league home run. Ortiz played the next three seasons at AAA with the Devil Rays, Rockies and Nationals to end his career. He has since gone into coaching. He managed single-A Hickory in 2009. In 2015, he became first base coach for the Rangers in Texas. He continued in that role in 2017.